"This mango salsa goes great with your favorite tortilla chips or as a topping for grilled chicken or fish! It only takes a handful of ingredients and is ready in just minutes!" 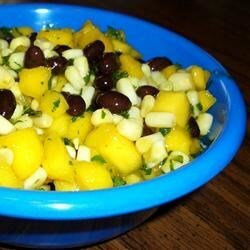 Stir the diced mango, black beans, corn, cilantro, lime juice, salt, and pepper together in a bowl. Chill at least 1 hour before serving. I too add onion and petite diced tomatoes - a little crazy salt doesn't hurt either. This recipe is out of this WORLD and uniquely different. Great with Tostitos Scoops! Really easy and great! I added red onion, extra lime,bell pepper,and a little chili powder... delicious! Excellent! No changes required. I make this yearly at my Mom's Birthday Dinner. Thank you.